SPA Leadership students were again honored to receive a number of awards in recognition of their many accomplishments in the 2010-11 academic year. The hard work, scholarship and community dedication of the Program’s Student Director, Amanda Merkwae (SPA ’11), were recognized at commencement by the University and by the School of Public Affairs. The University recognized her commitment to the greater AU community over her three-year tenure, giving her the Outstanding Service to the University Community Award. The School of Public Affairs acknowledged her exceptional contributions with awards both for Outstanding Service to the University Community and for her Outstanding Scholarship at the Undergraduate Level. Her Leadership classmate and former Student Government President, Andy MacCracken (SPA ’11), shared the SPA award for Outstanding Service to the University Community. Program senior Kathryn Baxter (SOC ’11), who served this year as a teaching assistant to Leadership Program sophomores and as Events Chair from fall 2008 to winter 2010, took home a cache of awards. Her dedicated work as a Student Government Senator to bring more women and women’s issues to the Senate likely contributed to her winning two awards, the Cathryn Seckler-Hudson Award and the undergraduate Alice Paul Award. The Seckler-Hudson award is given at commencement to the senior who best exemplifies qualities of character and achievement while making significant contributions to student government. The Alice Paul Award American is given by AU’s Women & Politics Institute and Women’s Initiative to people who exemplify the spirit, work, and vision of Alice Paul, an AU alumna, leader in the suffrage movement, and author of the Equal Rights Amendment. For her exceptional paper on Frank Kameny, Ms. Baxter also won the GLBTA Academic Achievement Award given to two students each year who have written an outstanding paper, done innovative research, or contributed academically to GLBT issues. Joining Baxter as a GLBTA award winner, first-year student, Zach Baldwin (SPA ’14), earned the First-Second Year Student Award for his extraordinary efforts in education and outreach about GLBT issues. Environment enthusiasts Jennifer Jones (CAS ’12) and Stephen Bronskill (SPA/CAS ’13) both won the coveted national Udall scholarship for their commitment and dedication to environmental protection. Bronskill has also been tapped together with his classmate Jose Morales, Jr. (SPA ’13) by AU to pursue the 2012 Harry S. Truman Scholarship. Morales was also delighted to receive the Robert H. Repetto Scholarship from the School of Public Affairs. Nate Bronstein (SPA ’12) and Carol Foster (SPA ’12) interviewed as national finalists for the prestigious Harry S. Truman scholarships. 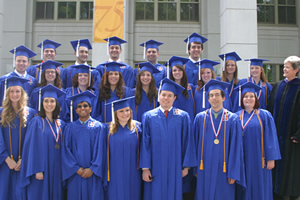 Bronstein served as AU’s Student Government President in 2010-11. His 2011-12 successor in that role, Tim McBride (SPA ’13), will be the fourth Leadership student in a row to serve as SG President. Kelsey Stefanik-Sidener (SPA ’11), 2010 Harry S. Truman Scholarship recipient, and Philip Cardarella (SPA ’12) were inducted into the premier honor society, Phi Beta Kappa, for their exceptional academic performances. Cardarella was given the unusual honor of being inducted as a junior. These stand-out students were also recognized by AU’s Honors Program. Stefanik-Sidener won an Honors Scholar Award and Cardarella took home an Outstanding Honors Junior Award. Joining them at the Honors Program awards ceremony were Morales and Todd Carney (SPA ’13). Morales was delighted to be selected an Outstanding Honors Sophomore. Carney was acknowledged as an Honor 101 Mentor. At the Honors Program Capstone Research Conference, Stefanik-Sidener’s and Merkwae’s capstones won honorable mentions. One third of the 33 students selected to present their research at SPA’s 2011 Undergraduate Research Symposium – and half of the award winners – were Leadership students. Stefanik-Sidener’s presentation on the Media Framing of Diabetes won recognition as the Best Presentation in Health Policy and the Best Overall Project in the Junior/Senior Category. First-year student Joe Wisniewski’s (SPA ’14) presentation on the “Mathematics of War: Using Statistics to Find Policy Solutions in Afgahnistan” was identified as the Best Presentation in the Social, Economic, Security Policy Session. Katie Hanson’s (SPA ’13) poster presentation on Food Insecurity and Geographic Location earned the award for the Best Poster. In the 2010 election cycle, a current first-year Leadership student was elected to office in Washington, DC. Deon Jones (SPA ’14) was elected to represent the residents on the south side of AU on the Advisory Neighborhood Council that advises the DC Council on local issues such as land use planning, including AU’s plans to expand the campus, building more student housing. President Obama invited Mr. Jones to the White House to attend a June reception honoring young elected officials. “Leadership students stand out. They are devoted servants to their communities. I could not be more proud of them,” commented Program Director, Margaret Marr.